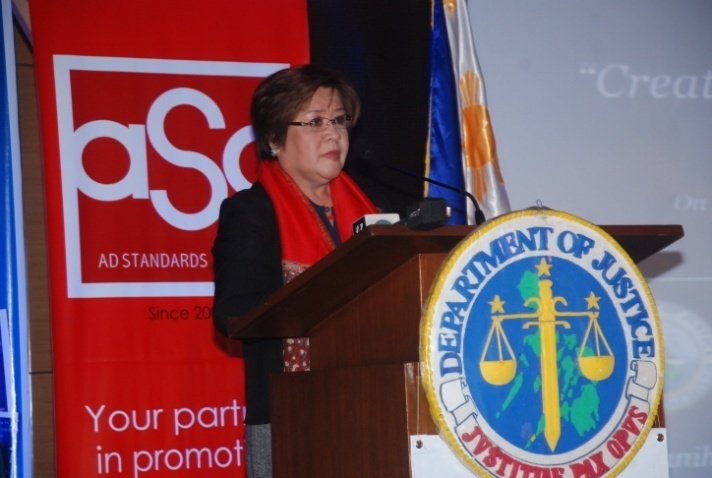 The state has to be the children’s champions,” reminded Honorable Laila De Lima, Secretary Department of Justice. De Lima was one of the guest speakers in the celebration of the 19th National Children’s Month, a media forum dubbed as The Media and Children: Responsible Communication, “Regulation and Self-Regulation”. The event held at United Bayanihan Center, Pioneer Avenue, Pasig City last October 20, 2011, was attended by invited participants from the broadcast and print media, advertising agencies, the academe, government and non-government organizations. Various organizations and companies pledged their commitments and signed on the giant board as a symbol to continue advocating for the best interest of the child. De Lima also discussed the state policy and the Committee on the Special Protection of Children (CSPC). Joining her was Dr. Bernadette Madrid, Director of the Child Protection Unit of the UP-PGH who talked on “The Child and Media” – the impact of media on children. She also discussed the root causes of newly emerging needs of children and how advertisements affect the behavior of children. Director Patricia Luna, Director IV, Social Technology Bureau of DSWD discussed Overview and Objectives of Child Protection Laws, rules and regulations; while Undersecretary Lourdes M. Transmonte from the Department of Labor and Employment (DOLE) talked “The Child as a Worker” in the media/entertainment industries – an orientation on applicable labor, laws rules and regulations when engaging in the media/ entertainment industries. KBP “Broadcast Standards on the Protection of the Child and the Guide to Media Practitioners” - pertinent provisions of the Broadcast Code on content affecting children; were discussed by attorneys Trishia Oco, Katrina Legarda, Anjanette Saguisag and Rejie Jularbal; respectively. They also raised awareness through examples on real-life situations. The event was in partnership with the Department of Justice (DOJ) – Committee on the Special Protection of Children (CSPC), in partnership with the Juvenile Justice Welfare Council (JJWA), AD Standards Council (ASC), Kapisanan ng mga Brodkaster ng Pilipinas (KBP), Philippine Association of National Advertisers (PANA) and Association of Accredited Advertising Agencies (4A’s).